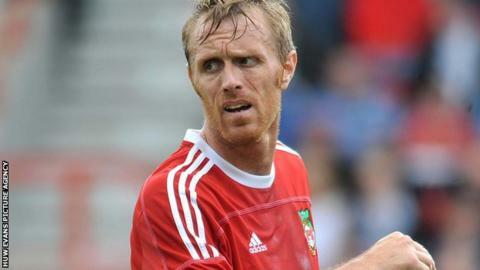 Wrexham went top of the Blue Square Bet Premier with a narrow victory over Gateshead in a rearranged match at Hartlepool United's Victoria Park. The Welsh side went three points clear at the top of the table and are now unbeaten in 13 matches. Striker Brett Ormerod headed home the vital goal on the 60th minute for the visitors. Grimsby, who were top of the table, slipped to second with their 2-0 defeat by Braintree. This was Gateshead's eighth defeat in 10 league matches. When the two sides met in November, it took a wonder-strike from Ryan Donaldson to salvage a point for the visitors after Nick Rushton's debut goal had put the Dragons in command. "I thought we deserved to win, we had the better chances. I thought we defended really well today, especially from the set-pieces and they only really had one chance. "There's going to be massive ups and downs from here on in, but we can only control what we're doing and that's okay at the minute. There's bits to work on obviously, but we look okay. "We're keeping clean sheets. We're defending well as a unit and we're not easy to score against, which is what I've been striving for all season."